Did you know that CYC Seattle put on over 900 racing starts in 2017? Join us and learn to race sailboats! Come learn from the best! Corinthian Yacht Club offers several ways to help you get started on sailboat racing or brush up on your skills. 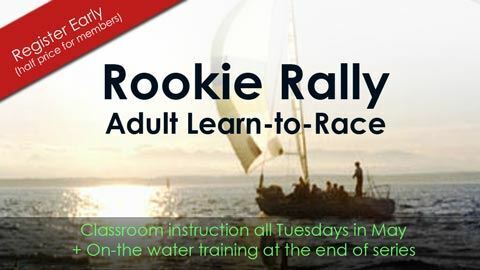 The Rookie Rally Educational series provides a solid foundation of racing skills via classroom instruction, hands-on exercises, and on-the-water activities. Our educational committee members are also glad to meet with you to help you work towards your goals. Come learn from the best! Bruce Van Deventer will be leading this educational series with special guests throughout. We will be meeting every Tuesday in May at 7pm at the club. May 1 - “Welcome to the Racecourse”: Walk through a typical race, handicap racing, one design, distance vs buoy races, paperwork/organizational requirements, conduct of a race per the racing rules of sailing, reading sailing instructions, starting sequence, and basic rules. May 7 - Starting & Upwind Legs: Rules during starting, finding the favored end of the line, standard starting tactics, the advantaged side of the course vs the advantaged side of the starting line, rules when sailing to windward, and at the weather mark. May 14 - Finishing & Downwind Legs: Downwind angles, gybing on wind shifts, rules when sailing downwind, leeward mark rounding rules and tactics, favored end of the finish line, rules when finishing. May 21 - Boat Speed Basics: Foils above and below the water, balance, main, jib, and rig controls, windward sail trim in light, medium, and heavy air, downwind trim, how to read a tuning guide, basic tuning for keelboats. The club will not be open for dinner or drinks but we will be coordinating an optional food delivery for those interested on a weekly basis. Each class estimated to run about 2 hours.